Sarah P’s comments: This position was posted two years. Woodstock is a well-established boarding school located in a remote area and might not be a good fit for those who enjoy city life. The school is well-established however and the reviews are positive overall (see International School Reviews for specifics). This position is offered through Teacher Horizons, a free recruiting agency I have written about before: my blog post. Woodstock School is seeking a Librarian to join their team in July 2018. The ideal candidate will have a Bachelors of Library and Information Studies or equivalent, five years’ experience in a school or academic library and at least two years’ experience in an international multicultural setting. Click here to view the full job description. Sarah P’s comments: For anyone interested in the international school librarian market ISS is hosting a first-of-the-season hiring fair. This is an opportunity to gain a break-in position for those without the ‘A list’ attributes, namely international experience, school media certification on top of an MLIS (but you should be able to show you are working to obtain it), and/or being single or part of a teaching team. You must be a registered ISS candidate to attend so if you are interested you need to contact ISS ASAP because establishing a file can take time due to credentials and recommendations needing to be verified. Please be aware that, while ISS is a recruiting agency they also now run their own schools as well, which are, unfortunately, not always top tier. So, be sure to join ISR, International Schools Review, and carefully read the reviews of any schools you might be interested in. International Schools Services is proud to be the first to offer this type of event for schools and candidates worldwide! It’s the best part of an IRC from the comfort of your home/office. Connect with schools early in the season and set up interviews. No taking time away from school – just you, your laptop (phone or tablet) and ISS recruiting schools connecting online. Everyone will be online at the same time, so you can instantly schedule your interviews. With the use of technology, finding a position has never been easier or more convenient. Schools will create a virtual booth, which candidates will enter when the event is live. Each school can customize its booth with information such as: logo and website; information about the school and country; salary and benefits packages; and open positions. Recruiters will be online and waiting to talk to candidates. Candidates can enter as many booths as they like, queue and communicate with recruiters. Initial communication will be done via instant messaging, but Skype is now fully integrated, so you can move directly to a follow-up Skype interview. Sarah P’s comments: Here we go with the start of the school librarian recruiting season. Reviews are mixed, please join International School Reviews to read the full reviews and to decide whether this is a good position for you. In the northeastern suburbs of Beijing, a new school is reshaping the educational landscape of both Chinese and world schools. Founded in 2014, Keystone Academy has reimagined the education of student global leaders. Already with a growing enrollment of over 1,000 students in Foundation through Grade 12, Keystone integrates the best teaching and learning practices from Chinese, American, and international pedagogies and leans deliberately on the exemplary traditions and practices of the leading boarding schools. Keystone Academy has state-of-the-art facilities for its library, maker, IT and design programs, not to mention arts and athletics. Now, instructional technology — both integration of technology and technology curriculum — is among the next strategic initiatives for the school. To this end, Keystone Academy has created a new position: Director of Educational Technology. This person will oversee all aspects of its instructional technology program: curriculum, integration, and professional development. The director will report to the Dean of Curriculum and serve on the school leadership team. Supervise the technology integration specialists and coordinators across all divisions. Serve as a role model for effective technology integration training. Ensure that faculty receive timely and thorough technology integration support for their classes. Evaluate the effectiveness of various instructional technologies and training methods as they are implemented at Keystone. Develop guidelines, frameworks, and policies for effective and essential technology integration strategies across the different divisions. Work closely with the Dean of Curriculum to ensure that educational technology is aligned with and serves the needs of the whole school’s curriculum. Coordinate the work of the technology teachers. Oversee the technology curriculum, from Foundation through Grade 12. Coordinate with external department chairs, division directors, and technology teachers to ensure that curricular objectives are met — in terms of content and skill. Teach or co-teach lessons, student activities, or classes as needed. Develop, deliver, and oversee faculty professional development experiences in the area of instructional technology. Ensure that a breadth of instructional technology learning opportunities exists, in terms of participant size (individual, small cohorts, and large groups), scope (one-time, on-going), timing (academic year, summer), delivery method (web-based, video, in-person, training documents), venue (on-campus, external), and modality (synchronous, asynchronous). Lead the development of an educational technology vision for Keystone. Manage all aspects the instructional technology department and program, including budgeting, staffing, and annual goals and objectives. Participate as an active and engaged member of the school leadership team. Serve on and/or oversee technology-related committees at the administrative, faculty and staff, and student levels. Evaluate emerging technology tools and innovative pedagogical methods, and guide senior academic leaders on strategic and operational decisions involving instructional technology hardware, software, and methodologies. Work closely with the department heads of IT, library, and design technology on issues and projects that overlap the multiple departments, including faculty training, technology support, instructional design, systems integration, and opening days planning, among others. Inspire the technology team and the broader faculty and administrator communities to model and support best practices in innovation, technology integration, and instructional design. Establish partnerships with outside organizations to support the strategic goals of the educational technology program at Keystone. Maintain an active presence in the local, regional, national, and international educational technology communities. Develop, maintain, and evaluate policies and procedures to ensure that instructional technologies are mission-appropriate and aligned with the school’s broader set of academic values and operational policies. Experience as a hands-on instructional technology integrator, and as a coordinator or director of an educational organization’s instructional technology program. A bachelor’s degree from an accredited college or university is a minimum requirement, though a graduate degree in instructional technology, information systems, or related field is highly desirable. Authentic interest in both Chinese culture and language, and the core values of Keystone Academy. Additionally, experience in an international educational setting or fluency in Mandarin and English are desirable but not required qualifications. A successful history of designing, implementing, and improving a broad spectrum of professional development experiences for educators. Experience proposing, piloting, and iterating through strategic projects in the areas of technology integration and instructional design. Experience teaching classes in a Foundation through Grade 12 educational setting. Experience as a supervisor and organizational leader, including: direct personnel management, project management, staff development and training, and committee leadership. A passion for educational technology, instructional design, pedagogical innovation, and professional growth, and a capacity to instill that passion in others. Excellent relational and communication skills. A collaborative, cooperative, and patient mindset. Visionary leadership aligned with the needs of a dynamic and diverse faculty and staff. Capability to lift up to 11 kilograms (25 pounds) and access hardware in hard-to-reach spaces. Sarah P’s comments: Here we go for the International School Librarian recruiting season. This is the area where the most international positions are listed and thus is the easiest way to break into international work. While it is still a good idea to join an agency and be vetted, the majority of schools are now advertising on TIE and accepting direct applications. However, attending this free ISS webinar will give you an overview of the field. ISS (International Schools Services) is one of the oldest US schools recruiting agencies but please be aware that they also now run their own schools as well, which are, unfortunately, not always top tier. So, be sure to join ISR, International Schools Review, and carefully read the reviews of any schools you might be interested in. For more information about the hiring process for international school librarians please refer to Chapter 3 of my book and/or visit the Resources page. 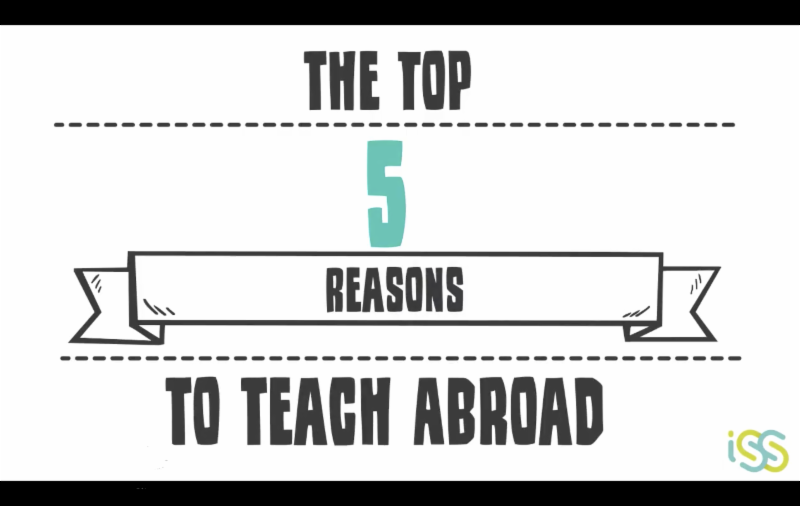 On August 30, 4-5PM EST, join us as we explore 5 fantastic benefits of teaching overseas. The webinar will feature some of our most experienced (and fun!) ISS international educators and finish with a 30-minute Q&A panel. Check out the event page and register! New to ISS? Join the community here and email your candidate number to edustaffing@iss.edu to register for the webiner. Actively recruiting with ISS already? Just register through your candidate dashboard!